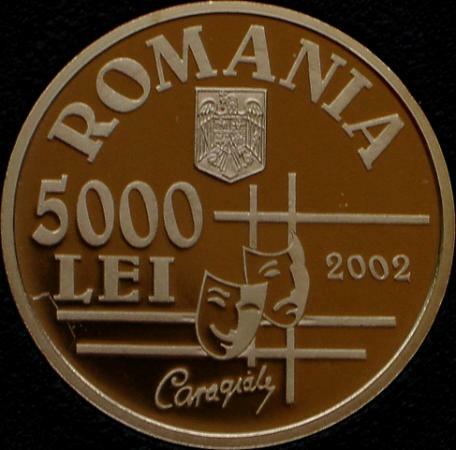 Obverse: ROMANIA, Romanian coat of arms, face value 5000 LEI, the mask of comedy and the mask of tragedy on a panoply, year 2002 and Caragiale's autograph Reverse: bust of the writer and years 1852 and 1912, along the rim the inscription 150 DE ANI DE LA NASTEREA LUI ION LUCA CARAGIALE. Under the bust lies a rhombus composed by four small rhombi. 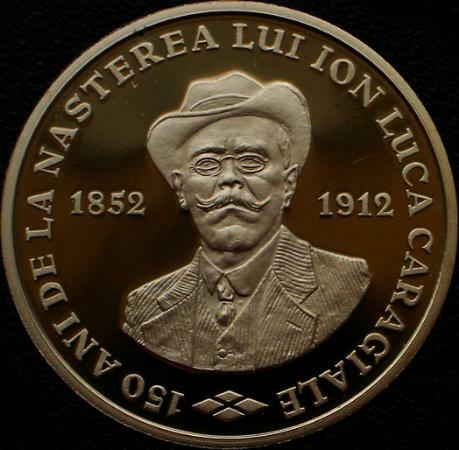 The grandfather of Ion Luca Caragiale, Ştefan, Greek or Albanian come from the island of Idra, came to Walachia in the times of prince Caragea. His father, Luca, had a lawyer career, whereas his uncles were actors and Thespians. Ion Luca Caragiale was and a copier at the National Theater (1871/72), codirector of the newspaper Naţiunea Română (Romanian Nation), he worked for several publications among which Timpul (Time) , where he had as Mihai Eminescu and Slavici as workmates, he became member of the literary Society Junimea in Iaşi, and he was also a merchant. Toward the end of his life, inheriting a fabulous sum of over 400.000 lei, he moved to Berlin, where he finally found his peace. On August 8th 1870 he participated in the "Ploieşti Revolution", when captain Alexandru Candiano-Popescu proclaimed the Republic. Although extremely young, Caragiale disarmed a police subcommissary ant took his post for a few hours! Caragiale was the one that misinterpreted the ciphered telegram "Medoc fini. Votca, Tzuica, dedans" for newspaper Naţiunea Română, that consequently announced the fall of Plevna on September 1st (during the Independence War), provoking a great scandal concluded with closure of the newspaper. In fact, Plevna fell on November 28th (old style). - But Caragiale does not take, Caragiale only borrows." The works of Caragiale - Shetches, Moments, short stories and comedies A Lost Letter, A Stormy Night, Of the Carnival's and Master Leonida versus Reaction - are still very appreciated by the Romanians and still contemporary. In the end we reckon that the memory of Caragiale, would have deserved more that the striking of 250 pieces of massive gold. A more significant and more profoundly considerate act of remembrance and esteem for his personality would indeed have been that one or two million pieces of common metal of really reasonable value (five or ten thousand lei) have been struck, pieces that could find their way from the Mint to the pockets of the Romanians. 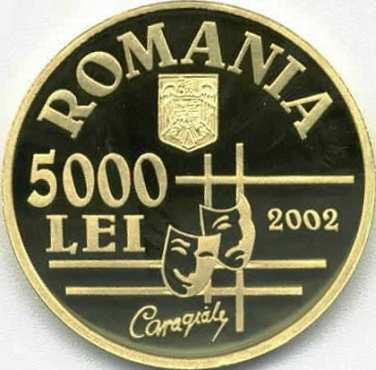 The readers less related to Romanian actualities should know that this coin, although bearing a symbolic face value of 5000 lei, could have been acquired for more than fifteen millions lei. 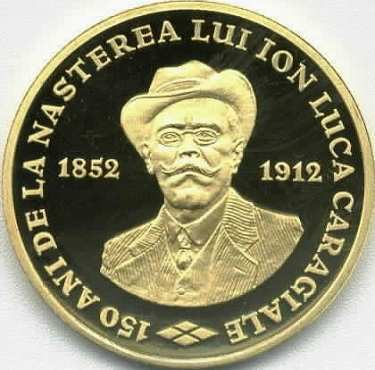 The gold coin pictures above are present on Romanian coins through the kind permission of an anonymous donor. The pictures of the tombac essay below are present on Romanian coins through the kind permission of Mr. Yu_L.Yan.